Mill-Max is pleased to announce the development of a unique, low-profile, compliant body socket receptacle, capable of press-fitting in FR-4 mounting holes between .041" -.044" (1,04 - 1,12 mm) in diameter. Featuring the Mill-Max #10 or #11 contact clip, rated at 2 and 3 amps repectively, these new discrete receptacles are ideal for socketing devices with miniature .010" -.020" (0,25 - 0,51 mm)component leads. The sleek bullet-shaped body, assists in centering the receptacle into mounting holes, and the shell features a wide-mouth countersink entry to guide delicate device leads inside. Manufactured using Brass Alloy on high-speed precision screw machines, this receptacle is gold plated on both the shell and contact surfaces for optimal conductivity and highest quality. Mill-Max part numbers 4993 & 4994 are RoHs compliant and available in bulk, or can be configured on hi-temp Kapton Polyimide film for package applications. Call Mill-Max Technical Services today to discuss your press-fit requirement. Discrete socket for miniature device leads between .010" - .020" (0,25 - 0,51 mm) in diameter. Sleek bullet-shaped body for easy board assembly. Wide-mouth countersink opening to guide device pin into the receptacle. Available in bulk or can be packaged on Kapton film. 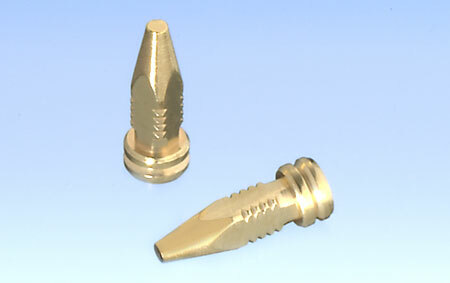 RoHs compliant, gold plated shell and inner MM#10 or MM#11 contact clip.